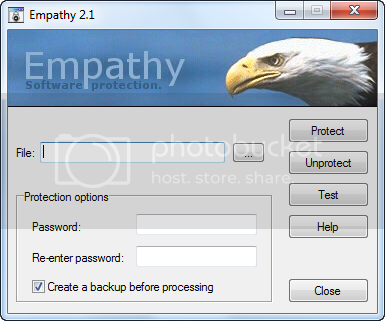 Empathy is a small, simple, easy-to-use but smart and reliable utility allowing you to password-protect any executable file. 1- Install and run Empathy. 2- Select any application’s executable files that you want to protect. 3- Enter and confirm your password (two times). 5- Finally, click the “Protect” button to complete the process. The next time anybody wants to run that application, Empathy will prompt a password form to be filled! The only downside of Empathy is that it only allows you to key in a single character password. To get the full capability, you have to send a postcard to acknowledge the author for using his software thus the term “postcardware”. Empathy is postcardware. You can use it freely for an unlimited period, but if you want to use it with all functions, you have to register it by sending me a picture postcard (not an electronic/e-mail postcard – you can send something with a picture of your city on it, or anything you like). After receiving the postcard, I will send you an unlocking code by e-mail. Empathy is the one that you need if you would like to do this operation in snap. Protected files can be run under Windows NT 3.51, Windows NT 4, Windows 2000, Windows XP, Windows Server 2003, Windows Vista, Windows 95, Windows 98 and Windows Me. Wow ... postcardware, yes a nice new term. Must be a picture postcard collector. The app looks useful too ! Btw had just written a tut a few days back on How to password protect use of any application in Windows. Yap it looks a good little application. Have to add it on my collection. Thanks for the link. Yap we should send a postcard so that he manage the application on windows 7. He has also some other applications on his site but no more work on them and the source also is available if someone wants to continu on it.